Nicole Gunther-Perin is modern woman whose yearns for a simpler time. Weary from trying to balance her role as a single mother of two young children and trying to advance her career as a lawyer, Nicole Gunther-Perin wishes aloud she had lived during a simpler time. Her wishes are overheard by the Roman gods Liber and Libera who watch silently over Nicole's bedside in the form a votive plaque she obtained during a trip to Carnutntum. Nicole awakens to discover she has been transplanted in time to an outpost in the Roman Empire circa 170 A.D. in the body of Umma a tavern owner and mother of two. 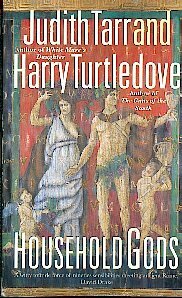 Household Gods, is one of those rare finds that succeeds in transporting its reader to the past with a rich and vivid depiction of the period that leaves you wondering how the authors could have possibly known so much of the details of daily life of the period that they include. I read this book over a year ago and its moving story and characters still remain fresh in my mind today as they did the minute I finished the book. Household Gods features a female central character, which is a rarity in the world of time travel. An average modern day woman trying to balance the demands of family and career Nicole finds herself faced with an entirely new set of challenges when she is transported to the past. Nicole faces a steep learning curve as she awakens as Umma and needs to know everything from running a tavern to understanding woman's place in ancient Roman society. At first her instinct is to view the world through her modern eyes, trying to impose her values on a culture and a society that is unable and unwilling to rise to her expectations. As Nicole becomes immersed in Umma's world she begins to begrudgingly accept some of the values and norms of Roman society circa 170 A.D.
Household Gods is not a story centred on any innovative or unique ideas, but rather relies on the strength of its characters and their development at its heart. The novel's climax comes as Germanic tribes attack the town and Nicole and the citizens of Carnuntum are forced to deal with their conquerors. Nicole's resolve as a woman is what bears her through this traumatic experience as it does through the other trials she faces during her time as Umma. The story concludes with Nicole being returned to the present by the same two gods that had cast her into the past. Awaking in a hospital, Nicole reveals in the modern conveniences she had taken for granted prior to her Carnuntum experience. Both Judith Tarr and Harry Turtledove do an excellent job balancing the storytelling with factual details necessary to bring the past to life and tell a convincing story in the process. While I am not normally a big fan of Mr. Turtledove's, the combination of both author's skills has produced an entertaining novel that deserves to be read by more than just time travel fans such as myself.